The Facilities Management Fleet Team administers the assignment, safe utilization, maintenance, repair, and replacement of fleet vehicles and equipment. FM Fleet Team offers an array of safe, sustainable, and reliable mobility options. We supply over 250 vehicles, and over 80 pieces of equipment empowering staff to perform their essential services. Our mission is to support Facilities Management staff by providing a high value fleet of safe and efficient vehicles, enabling the staff to effectually perform their duties. 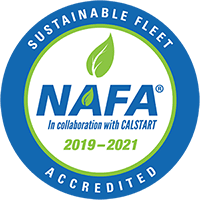 The Facilities Management Fleet is accredited by the National Association of Fleet Administrators (NAFA) and Calstart as a Sustainable Fleet. Hours of operation: Monday-Friday, 7 a.m.-3:30 p.m.
Keys to the vehicles can be picked up from the FM service desk in Lower Leake. Please return vehicle to the Lower Leake parking lot when finished. Lock the vehicle and return the keys to the service desk staff. Always remove keys and lock vehicles when unattended.